Vintage, Le Vin Du Parisien Eiffel Tower Wine Label, Mint! William J Kozersky, Philatelist > Collectible Labels > Wine Labels > Imported Labels > Vintage, Le Vin Du Parisien Eiffel Tower Wine Label, Mint! 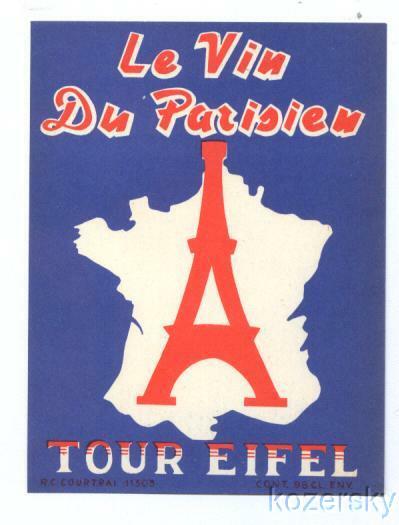 Vintage French Le Vin Du Parisien Eiffel Tower Wine label. Graphic of the Eiffel Tower superimpossed on an outline of France. This label measures about 3 1/2" x 5". It is in excellent condition with no tears, bent corners, or creases. This original, unused, mint label, would be a great gift to a friend or loved one, or yourself.